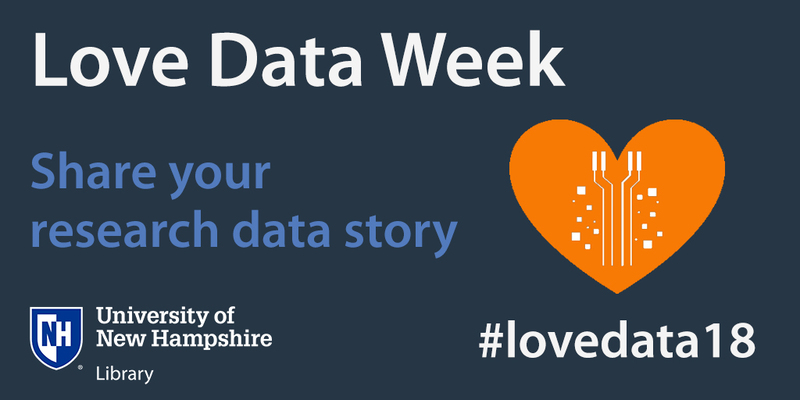 Love Data Week (LDW) is a social media event coordinated by research data specialists, mostly working in academic and research libraries or data archives or centers. Similar to Open Access Week, the purpose of the LDW event is to raise awareness and build a community to engage on topics related to research data management, sharing, preservation, reuse, and library-based research data services. Love Data Week is February 11 - 15, 2019! This year's theme is “data in everyday life”. We want you to participate! Share your experiences, learn from others, and find out about new resources. Send us your DOI! If you have deposited your data in any repository, send us your DOI and we will create a record in the UNH Scholars’ Repository’s Data Catalog that links to your data – increase your visibility and chance of discovery! Copy in your DOI and press send! A 5-day international event to help researchers take better care of their data. Data Tree is a free online course with all you need to know for research data management, along with ways to engage and share data with business, policymakers, media and the wider public. Essentials 4 Data Support is an introductory course for those people who (want to) support researchers in storing, managing, archiving and sharing their research data. Best Practices for Biomedical Research Data Management is aimed at a broad audience including librarians, biomedical researchers, undergraduate and graduate biomedical students, and all other interested individuals. 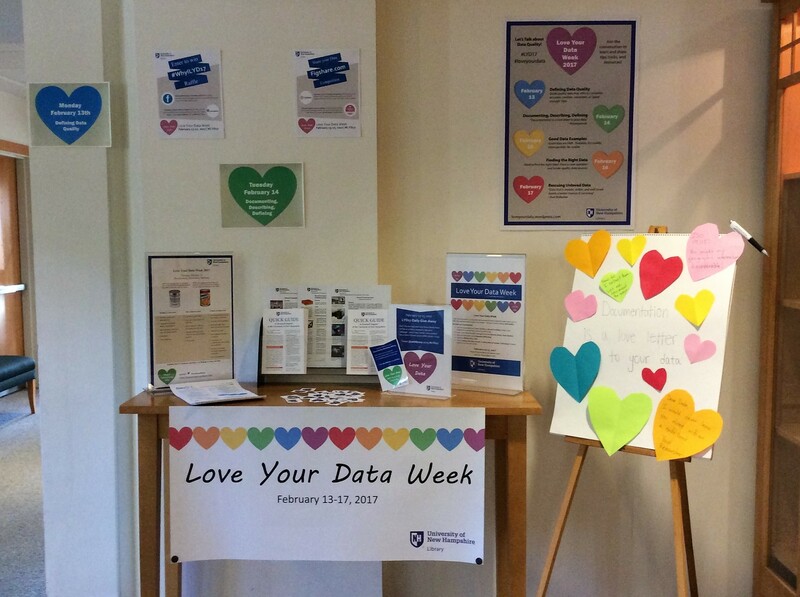 The theme for Love Data Week 2017 was Data Quality. The theme for Love Data Week 2016 was Good Practice. To celebrate LDW 2018, we held a Data Stories @ UNH contest. UNH students, faculty, and staff were invited to submit a true story about an experience they have had with research or scholarly data. In short essay format, participants were encouraged to share their data story with us. We encouraged entries from researchers and scholars from every discipline working with data of any shape and size! Data Stories @ UNH was sponsored by the Graduate School, Research Office, and UNH Library. I was 20 the first time I traveled, alone, to India to begin my research. Looking back, I can’t begin to think what gave me the courage to leave my life behind for twelve months as I embarked on a journey to a country I’d never visited, doing work with which I had no experience, in a place I knew very little about, including the language. Fresh from my first field research experience in the Bahamas, I was newly inspired to start research of my own, and - in my mind at least - become a scientist! So, I decided to go to India to study water quality in the Himalaya. I had no idea the beauty, wonder, and discovery that awaited me. The first few days in India were a blur of rich colors and spicy masalas, harrowing rickshaw rides, and monkeys and cows parading about the streets and hanging out in the subway. My heart beat with steadfast excitement as the beauty of New Delhi slowly revealed itself to me. Eventually, it was time to begin the layered process of organizing my fieldwork. There were three lakes I planned to sample Dal Lake, Kareri Lake, and Rewalsar, the holy lake in the Indian states of Jammu Kashmir and Himachal Pradesh. I planned to fly to Srinagar in Kashmir and slowly work my way down over the course of a month. With the help of a good friend, Sudha, I spent the next couple of weeks gathering supplies, reading up on protocols, and packing for the field. At times it felt like I was running around Delhi on a treadmill, working non-stop but never being able to find the right shops and the right supplies. My first few failed attempts to locate a screw or funnel or some other random object I needed I would return to the lab frustrated. One day I was sharing my frustration about not being able to find a rope. I was admittedly more upset than necessary but Sudha turned to me and asked sweetly, "Why are you here? Why are you doing this?" And without hesitation, I responded, "For science!" It wasn't a particularly eloquent or profound answer, but it brought with it a fiery drive that quickly made me forget about my momentary inabilities to locate the needed supplies. That became a sort of light rallying cry between us and for me, especially in the field. During difficult stretches of treks or late nights in the lab I would think to myself, "In the name of science!" and that would push me forward. The day before, everything was ready, the first time I had ever been completely packed the day before a trip. I checked my email to confirm the flight time for the following day and my heart fell as I saw that the flight was canceled. There were no flights for another two weeks! Slightly panicked, I did what anyone would do in this situation. I called Sudha. I'd become so used to traveling via flight that I didn’t realize there were other options. In India, there is always another way. After a quick regroup with Sudha she suggested I take a bus. A twenty-six hour bus! Skeptical, but out of options, the battle cry popped back into my head - for science! I grabbed my bag, found an auto rickshaw, and I was off. The bus was filled with Indian tourists, not a foreigner in sight, building my excitement for the trip. This was the first trip I'd taken alone, anywhere, and I was determined to enjoy it. The bus, though worn, was inviting, the mustard yellow seats squishy from journeys past with pale pink curtains drawn across the window to keep the late Indian summer sun out of the cool A.C. compartment. I found my seat, threw my bag above, and waited as the bus was filled. As the bus exited the station, or really just a sandlot with a small ticket desk under a tent, the driver put on the classic Bollywood song, aaj mausam bada, the tabla beating to the rhythm of the bus traveling through the crowded roads of Delhi. I spent the next hours staring out of the window, mesmerized as we moved from the hectic neighborhoods of Delhi to the calm, crisp air of the Himalayas. At some point, I'd fallen asleep because when I awoke the sky was black, peppered with a few sparks of light I could see from my window. The bus was quiet, but for some reason, we'd stopped. I got up to investigate and as I exited the bus the coolness of the Himalayan air bit my exposed legs like puppies playing too rough. I saw the driver and a few other passengers sitting on a wooden bench in what appeared to be a closed makeshift restaurant, just a single light above them illuminating the scene. They were drinking what I assumed to be chai, the bus had made many chai stops throughout the trip. I walked over and ordered a tea, the chai guy looking a little worn but content where he was. I reached out, taking the tea from his small, wrinkled hand and as I tasted it, I felt a pulse of surprise move along my taste buds. This was not the black tea mixed with masalas, ginger, and milk I had grown accustomed to over the last month but a sweet, light, floral green tea that fully engulfed all your senses as you drank it. This was Kashmiri tea; we had made it to Jammu. The next ten hours was a bumpy, curvy blur up the mountain. At hour 28 I began to feel the excitement wane and the restlessness creep in, and hunger was poking me. The bus stopped once more and we all piled out. Feeling a new burst of energy, I thought perhaps we had finally arrived. But as I watched everyone move into the dhaba, a roadside restaurant with simple, but usually delicious quintessential Indian mains, I forgot about all the hours of travel and hurried in with the group. We lined one of the five long tables, sitting neatly in a row. It felt like I was back in Elementary school, the obedience generated from an organized queue stunning me because usually it was a mad dash or push for service. The servers, moving like wildfire, blared around us setting plates of rajma chawal, or spiced kidney beans with rice, before everyone. As mine was placed before me, I waited, internally rather impatiently, for a spoon, but none came. I looked around thinking that maybe they had missed me and then I realized the redundancy of spoons. Everyone was eating with their hands. I shrugged and joined them. There is a talent in eating with your hands, similar to chopsticks, that Westerners do not fully realize until they try and fail. You must cup your hand the right way, mix the correct ratio of rice and beans, place the mixture on the appropriate spot of your fingers, and then gracefully scoop it into your mouth. It’s a complex methodology that I did not yet fully grasp and I had the stains on my clothes to prove it. The first lake I was meant to sample was Dal Lake in Srinagar, a small city known for its dried fruit, handicrafts, and houseboats. After 30 hours, we'd finally arrived. There are two places where everything always seems to take longer than you think it will: India and the lab. Walking on cobblestone streets to the houseboat I'd rented, passing great, white mosques, busy with the sound of prayer and plump, stout women with beautiful silver dangling earrings and vibrant Kashmiri silk scarves I quickly saw the beauty of this place. But there is a dark veil that shrouds this city. Srinagar has been the center for the Kashmiri resistance to Indian rule and policing beginning since 1989. There are frequent protests and bombings that often result in high numbers of causalities. My advisors at Delhi University had cautioned me to be careful when working on Dal Lake and though I had a letter of support from my advisors, I was nervous. I reminded myself of the need to be respectful, to use my best judgment, and listen to the advice of the locals. The next day, I awoke early, excited to begin my first sample collection. I'd rented a smaller boat for the day driven by Dameer, his name meaning heart or conscious. Finishing up my tea I grabbed my bottles, meters, and kits and boarded the small, wooden boat. I again felt the hesitation move through my body but I reminded myself of why I was there - for science! Dameer sat in the back of the boat under a small roof decorated with the rich fabrics of the Kashmir region and used what looked like a large bamboo fan as a paddle. Checking to make sure I had everything I needed he asked, "Ready?" And I assured him, and myself, that I was. We moved in the direction of my first sample site, Dameer paddling the boat while I checked our coordinates with the GPS. Once we arrived I dumped the contents of my bag onto the boat, grabbing bottles to take the water samples that would be taken back to the University. I reasoned I could at least get the water samples for water chemistry analysis if for some reason I had to stop mid sampling. After, I grabbed the meters - one for pH, salinity, total dissolved solids, and conductivity. I worked quickly, taking the readings and replications, swiftly recording them in my field notebook. I wrapped up the first site’s sampling by taking planktonic, or floating algal samples and benthic, or bottom algal samples to be identified and counted back at Delhi University. As I closed the last lid on the final bottle, I stuck my hand into the lake, the water bringing with it reassurance and a newfound sense of confidence. I looked to Dameer and asked, “Ready?” and he smiled as we made our way to the next site. I stayed in Srinagar a few more days, exploring the cobbled alleys busy with vendors of mysterious sweets and bright red chilies and spices. When it was time to leave, I decided to take a shared taxi down to my next site, Kareri Lake. With help from many kind-hearted strangers who were patient enough to listen to my broken Hinglish, I found my way to the taxi stand, threw my bag on top of the van and got in. What was meant to be an eight-hour bus ride turned into sixteen with traffic and I arrived at my transfer city, Kushinagar at 1 AM. I needed to take a bus from Kushinagar to Kareri where I would eventually hike up to my field site, but there were no buses leaving until the morning. I grabbed my bag and as I was about to ask the driver if he could recommend a guesthouse, he abruptly got back into the car and pulled away. I stood on a dark, unfamiliar street with five liters of water and twenty kilograms of sampling gear, alone. I could feel the fear moving through my body. I looked at my bag laying on the ground, thought rather meekly, “for science” grabbed the bag and started down the street. Still a little down from the experience of arriving in Kushinagar, I awoke early to get the first bus out of there. But where did the bus come? I'd learned by now that most people living in India don’t like to say they don’t know where a place is. If you ask them where to find a place, they will tell you a direction, even if they don’t know so it’s best to take the average of a sample size of about five people, depending on their apparent confidence level. Using this background information, I moved through the same street I was abandoned on the night before, now busy with public buses and auto rickshaws buzzing around, collecting data. At one point I happened upon an auto rickshaw driver sitting in his rickshaw. I asked, “Do you know when the bus to Kareri will come?” and he responded, “Every fifteen minutes.” Excited, I asked him where I could catch it and he gestured to the road, right in front of his auto and promptly told me to take a seat in the back and wait. Skeptical, I sat down. A chai guy came around and the driver asked if I would like some. I'd learned by this point to never say no to chai - not only can it be seen as rude, but also it’s chai, it’s delicious! Soon after the chai guy brought my tea, a monk came over with a small, green snake around his neck. The auto driver called him over and told him to put the snake around my neck. I shrugged, figuring I couldn’t think of a good reason not to do it, and let him place it around my neck. A chaat wala, or a person who sells traditional Indian snacks, was shouting to the street that he had samosas for sale. The driver looked at me and I smiled and he called the chaat wala over and ordered two samosas, handing me one. At this point, I was too deep in amusement to be skeptical any longer. Snake around my neck I sat in the back of the rickshaw eating samosa and drinking chai, chatting and laughing in broken Hindi and English with a complete stranger that had already gifted me so much in so little time. Thirteen minutes later, the public bus stopped in front of the rickshaw, exactly where the driver said it would. I finished my chai, returned the snake, and the driver helped me with my bag onto the bus. As it pulled away he waved a few times, sharing a small but warm smile, and that’s when I realized we’d never exchanged names. That was the moment when I knew I could love India, that being there would bring such love and light into my life. Any country where there are people willing to give so selflessly to a completely foreign stranger must be a place full of love. I’d made it to Kareri safely thanks to my friend in Kushinagar and was about to start the 26 km trek up to Kareri Lake. Overconfident in my navigation skills I decided to make the trek myself without any guides or porters. The first part went well but unsurprisingly, I found myself soon lost. It was beginning to get dark and I was becoming concerned even though I had a full camping set. Eventually, I ran into a small boy that couldn’t have been older than twelve. I asked him if he knew the way to Kareri village, a small mountain village on the way to the lake. Enthusiastically, he told me that he lived in Kareri village and that I was welcome to follow him there. About halfway up the mountain, I started to grow tired from the weight of my bag. I told him that I would stop and meet him in the village the next morning. He responded, “No, you can’t do that. There are bears. Do you know bears?” I certainly knew bears. “In the name of science!” my mind reminded my body and we both pushed onward. Realizing the ridiculousness of my plan to solo hike to Kareri, I asked Raju, the boy I’d met on the mountain to join me. His family opened their home and kitchen to me and I found myself again reflecting on the kindness and selflessness of the people I'd been so fortunate to meet. We set out the next day for the lake, our stomachs full of paratha, a stuffed Indian bread. A clear, sunny day lay before us as we moved up the steep mountain. Eight hours later we made it. I threw the pack down, again dumping the contents, and set to work. This time there was no fear or self-doubt and I worked with the dexterity of a seasoned field assistant, only this time I felt a certain pride in the numbers I placed in my field notebook, as I wondered about all it took to get here, to get this data, from myself, but from so many unexpected others along the way. For science indeed, but there was something else there, too. The stars at Kareri Lake were something special that night, crystalline eyes in the dark Himalayan skies peering down at the world below. We camped on the top of the mountain in a small shelter next to a Shiva temple, the Hindu God known as the destroyer of evil. In the morning I awoke early to finish sampling, we packed our bags, mine now weighted with 5 more liters of water, and headed down the mountain after a quick breakfast of Maggi, a popular noodle soup. I left Raju and his family as quickly as I'd met them, my schedule pushing me to the next field site. But, in a way I can’t fully explain, my research, my data belongs to them as much as it does to anyone. I arrived in my last sample site, Rewalsar Lake, without a reservation only to find that the biggest festival of the year was happening and all the rooms were booked. Quite frantically I begin asking locals if they knew of anywhere I could stay, explaining that even a floor would suffice. In a momentary lapse of purpose, I became distracted by a deep turquoise dragon eye necklace. Chatting with the man selling them I explained my situation and he proceeded to call up a friend who conveniently had a spare room. Within minutes my problem was solved and I was sporting a new necklace. I thanked the man profusely and he told me that helping people was his meditation, that giving was his puja, or worship. You can go to temple, you can pray, but what matters is how we treat each other. Through all my days studying science, I had never bothered to ask the why. I was told that this was the method, and it made sense to me to take replications, as many as possible, taking the average. But why were they different in the first place? Of course, that question has an answer: because there is human error in both the machine and my measuring, the Earth is dynamic and conditions are never the same, and sometimes, yes, the meter is broken. But, why? The most humbling truth of science is its inability to prove anything. Even if a billion leaves fall from the branches of a million trees, thousands of years longer than the existence of all mankind it will never be called “the fact of gravitation” but shall forever remain a theory. The Buddha himself talks about the duality of cause and effect, the very principle on which the scientific method is based and the Buddhist’s concepts of ultimate truth mirror those of quantum physics where both challenge what it means to “exist”. What began as a research trip brought me into an ethereal world of compassion, adventure, and discoveries unlike the ones I'd intended on making. I began to realize that, while sometimes effective, the battle cry I had rallied behind did not fully do the work justice. Research goes deeper than the data, past the numbers, the statistics, the publications to the people and communities that make those hypotheses and research objectives testable, that give the data its meaning. Data has the power to bring together seemingly different individuals and the ability to enrich the lives of those who work to collect it - all of those who work to collect it, not just the scientists. For science, certainly. But for people, and for love too. The cold. The o-ring data. They were informed and they still decided on the grand spectacle of a shuttle launch. Seventy-three seconds later the shuttle exploded, sending a fireworks array of guilt-ridden vapor trail signatures into a cold blue sky. He watched live with his students in stunned silence. Later, cradling his just born daughter he watched a re-run and cried, knowing how some in Florida that night would never be touched by those they loved again. At Goddard Space Flight Center that summer he learned that increasing atmospheric CO2 levels could radically affect the climate in our children’s lifetime, and that all natural resource satellite data needed to be “ground-truthed” to ensure the satellite data was accurate. A vision emerged - Christa’s Teacher In Space mission could be accomplished with no more lives risked, and our students’, our children’s lives, might be spared the unknown effects of climate change. He found a natural resources professor at the University of New Hampshire (UNH) who said “yes we can” to his plan to have K-12 students carry out authentic field, lab and satellite data analysis. Their alliance began at Concord High - Christa’s school - his school, and became Forest Watch. For twenty-one years, thousands of students from over 350 New England schools learned how to collect, report and interpret data that showed the correlation between seasonal ozone (smog) levels and the health of white pine trees just outside their schools. When the science professor retired, Forest Watch was retired with him. Like all good science though, peer review of the Forest Watch model and information resulted in new student-scientist programs: Project Smart at UNH, Watershed Watch at Elizabeth City State and UNH, World Ocean Watch in southern Florida, and the GLOBE Program in over one hundred countries around the world working with over a million students since 1995. But it is not enough. Media and political spectacle now obscure the reality of climate change and other threats to global biodiversity, and more and more people in this country do not trust the truth-defining data and information advanced by our scientists. An SOS was sent out and this time the teacher-professor alliance was joined by other scientists, pre-service teacher training programs, retired and active K-12 math and science teachers, with bi-partisan political and New Hampshire Department of Education support to plan for the development of performance-based, authentic data-driven science activities, that spiral upward through the grade levels, with interpretation, and media and societal outreach guided by artists, and IT professionals. SOS–Success on STEAM needs you now to champion its STEAM (Science Technology Engineering Arts Math) message to promote societal education and enlightenment for a sustainable economic and environmental future.